La Liga 2016/17 draws to a close on Sunday and after beating Celta 4-1 on Wednesday night, a draw away to Málaga would be enough for Real Madrid to secure the trophy. Barça are three points adrift, and all they can do now is make sure they beat Eibar at the Camp Nou (TICKETS) and hope for an upset in Andalusia. In 1992, just a couple of weeks after Barça had won their first ever European Cup at Wembley and with the city gearing up to host the Olympic Games, the league title celebrations came as an unexpected bonus on June 7. Johan Cruyff’s Dream Team were at home to Athletic Club on the final day. Two goals from Hristo Stoichkov had that game wrapped up by half-time, but any hope of winning the title depended on leaders Real Madrid slipping up in Tenerife. And the news wasn’t good. With goals from Fernando Hierro and Gheorghe Hagi, the all-whites looked on course for a comfortable win. Quique Estebaranz pulling one back for Tenerife did little to change the sombre mood in Barcelona. But with just 13 minutes to go, news came though that Madrid’s Ricardo Rocha had put the ball in his own net. 2-2. As things stood, Barça were champions! Surely not.. But no. It was Italian born striker Pier who had found the net! Incredibly, Tenerife now led Real Madrid 3-2 and so it remained for an agonising ten minutes before Barcelona city centre was awash with supporters celebrating one of the most extraordinary Liga title victories of all time. A year later, the situation on the final day of the season was almost identical to that of 12 months earlier. Once again Real Madrid led Barcelona by the narrowest of margins going into the final day, and once again they were off to Tenerife. At the Camp Nou, Stoichkov was the hero again, scoring against another Basque side, this time Real Sociedad. At the precise moment when the Bulgarian found the net, Argentine forward Oscar Dertycia put Tenerife ahead at the Heliodoro Rodríguez López. Surely the same thing couldn’t happen again? Indeed it could. Real Madrid found no way back into their game, and by half-time were trailing 2-0 after Chano extended the home side’s lead. There would be no further goals at either stadium. After winning the league just three times in thirty years, Barça had now won the Spanish title three times in a row! 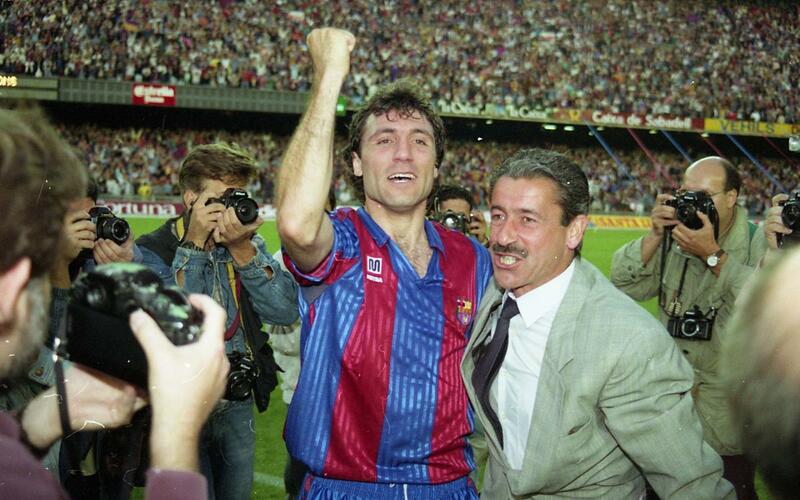 In 1993/94, and for the third year running, Barça went into the final the final round of fixtures in second place. Only this time, the leaders were Deportivo. The Catalans got their part of the job done quick, beating Sevilla 5-2 at the Camp Nou. But that win would be meaningless if Depor won their own game at home to Valencia. There were no mobile phones in those days, but fans had their radios pegged to their ears and every now again the TV cameras switched to Riazor. The news was always the same. No score. The 90th minute arrived and suddenly the Camp Nou went silent. Penalty to Deportivo. 1,200 km away, Miroslav Đukić took the kick – and Valencia keeper José Luis González’s save not only broke thousands of Galician hearts, but also those of the majority of neutrals who wanted to see the trophy go to La Coruña for the first time ever. But at FC Barcelona, the crowds erupted with joy. For the third season running, the title had been won on the final day. A quarter of a century has passed since those amazing events. But this Sunday, Barça fans around the world will be hoping that there might be room for one further instalment in the saga. Could that be an omen? Let's keep our fingers crossed and hope that it does!